Remember “Who shot JR?” I certainly do. In 1980 I was only 10 years old when the iconic episode of Dallas captivated the nation and the world – too young to stay up to watch it. Nevertheless, I remember everyone at school talking about it the next day. I recall feeling that I missed out on a communal experience. It was an era when primetime TV – and really no other medium – ruled. There have been very few seminal cultural experiences of such magnitude since. “Who shot JR?” seemed to mark the end of an era when every show, even ones that were taped, were really live in a sense because of the next-day water cooler conversation. Everyone wanted to be a part of it. By the mid 1980s such experiences started to fade as time-shifting and VCRs became commonplace. A decade later DVRs and on-demand streaming made the live tune-in all but irrelevant. Network television began to fight for their share of attention on a crowded dial dominated by niche networks catering to every interest. And by the mid-to-late 2000s, with Internet usage skyrocketing, some predicted that primetime TV as we know it was dying. According to Nielsen, the average American in 2010 watched about 35 hours of TV on any given week. This is up one percent from the prior year. High definition broadcasts, arguably, are contributing. But something else is going on. Simultaneous media consumption across four screens and, notably, social networking and apps have reignited the communal experience around TV. And it’s not just live events like sports and award shows that are benefiting, but also canned, pre-recorded primetime TV shows. In an always-on age there’s a new feeling seeping in to our psyche that if you fail to tune into both the set and the ‘net at the same time, you’re missing half the fun. Some 60% of viewers use the Internet while watching their favorite shows, Nielsen data shows. This isn’t a natural phenomenon. The networks and syndicators have all devised very sophisticated ways to use new technology to encourage viewers to tune in to shows in primetime. In July, The Discovery Channel launched a special iPad app around its Shark Week event that connected viewers as episodes aired. The application featured conversations, quizzes and additional content. This was complemented by a robust effort to engage fans on Twitter, Facebook and Discovery’s own websites. This fall, USA Network is broadening its successful Character Chatter effort, which connects fans with the stars of their favorite shows while they are airing. USA is now bringing stars like Callie Thorne, star of Necessary Roughness, into Facebook to engage fans. Around the same, CBS reinstated Tweet Week, a similar effort that lets fans talk to both the talent and the production staff for several shows, all via Twitter. Twitter today has become such a part of the viewing experience that there’s even an app that allows the Tivo crowd to experience the chatter as if they are watching the show live. The Next Web recently reported that Rewinder, a UK-based service, will replay tweets in sync as you watch recorded shows – but for a fee. All of this is good news for advertisers. The eye candy not only draws in viewers to the programming but, by circumventing the need for ad-skipping DVRs, the commercials. The chatter around the ads is as much a part of the experience as the conversations around the content. There are some signs that TV’s re-engaging its most coveted viewers. According to Nielsen, tech-savvy 12-24 year-olds are more connected and therefore more adept at using mobile devices to watch shows. This doesn’t bode well for the networks or for advertisers since, sometimes, the ads can be skipped. 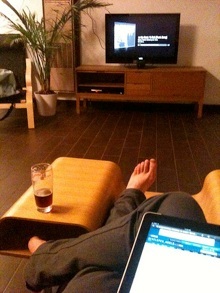 However, by turning TV programming into a true two-screen experience, it changes the equation. It makes the live experience more valuable, especially for the younger set. The data show that 18-34 year-olds are the most active demographic on social networks. So far there are clear are signs that it’s working. 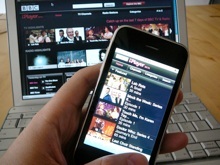 Knowledge Networks found that simultaneous Internet-TV usage is growing dramatically among young adult viewers. It’s unclear how long the networks and shows can keep the innovation going to keep fickle audiences engaged. However, with tablet and smartphone usage growing, the prospects seem brighter than ever as we start the new fall season that communal TV is undergoing a renaissance.